Since I don’t have much else to say, how about a rundown of current WIPs (shouldn’t that be WsIP?) and planned future projects. Vera Knee Socks – I put the first, incomplete sock on waste yarn so I can start the second one, but have I? Nahhh. Star Gazer Lily socks – I’m past the heel turn on the first sock. Meh. Modular skirt (aka Koigu Skirt) – I’m done the first tier, and am done 6 of 9 hexagons from the third tier. It’s really good subway knitting, as I can do about one and a bit sections of the hexagon per ride. I’m going to use the brown Knitpicks Palette for my contrast colour; although it’s not merino, the colour is perfect. Katy – One more sleeve seam, a couple ends, and I’m done, done! – Patons Urban Aran, as a cardigan, out of Elann Highland Chunky from last year. 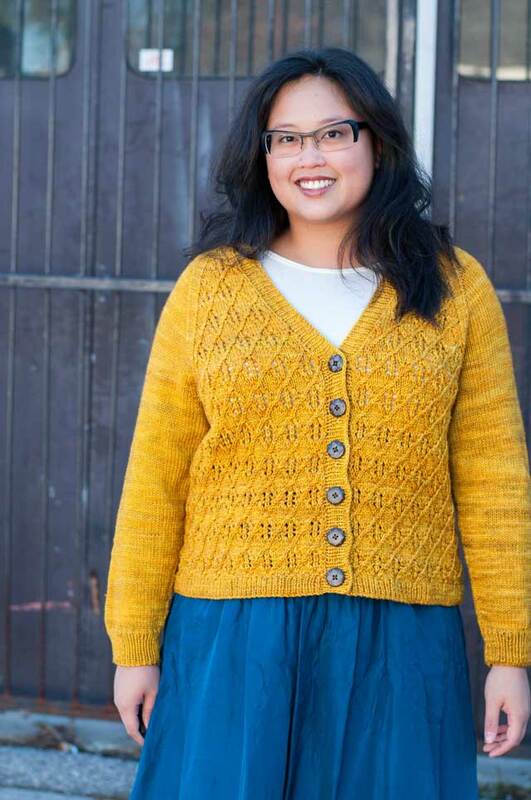 – Nordic Memories pullover from Interweave. I think I’m going to use Knitpicks Merino style, in similar colours (Hollyberry and some kind of yellow…I’ll have to go look at the colour cards). – socks, socks, lots of socks! – presents…maybe just a few this year. Whew, looks like I’ve got projects for the next couple months! There’ll surely be something shiny and new that I’ll just haaave to knit, but for now I’ll keep all this in mind! What issue is the ‘Nordic Memories’ in? I’ve been looking for a nice fair isle to try out, and it’s nice to see something that doesn’t look like a Christmas stocking. you know i have been looking at that nordic sweater for the past couple of winters thinking hmmm i would like to make it someday. we are heading into summer now – so maybe next winter will finally be the one. i always loved that nordic memories sweater. Laura, I’m glad you found a brown that you liked for the skirt. Oooo…that Nordic mitten was gorgeous, I’d be excited to see the progress of one on your site! yummy colors. I’m doing the Nordic Mittens right now, too, and I’m completely addicted. I had a hard time finding the right colors, so I’m more red than the tan and brown (the brown was way too close to the dark plum background color). You’re going to have so much fun!